I've been pretty busy, so I'm late to post this review, but I took fairly extensive tasting notes during my meal, so hopefully I can remember and capture most of the details here. But unfortunately, I do think some details have slipped my mind. Note to self: make sure to write posts within a day of dining! Anyway, last Saturday, we headed to Cyrus for lunch. 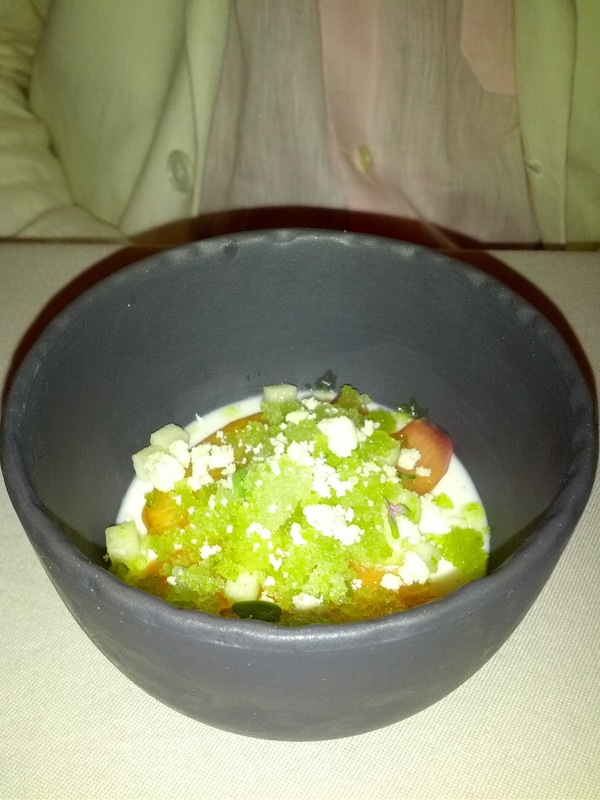 Cyrus is a two Michelin starred restaurant located up in Healdsburg. I went there a few years ago, and at the time, it was the best and most memorable meal I'd ever had. I've been eager to go back, but given that it is over 1.5 hours away, I haven't really been able to find an excuse to make it in for dinner. I was excited to see that they just started a Saturday only lunch service in May, which seemed like a much better fit than dinner, since we could drive up, have a long leisurely lunch, and then spend the day in the sunshine and warmth of wine country! The lunch experience is exactly the same as the dinner, a long formal meal, either 5 courses for $108 or 8 courses for $135. The 8 course includes one more savory main dish, a cheese course, and another dessert. For most of the courses, there is a choice for each. In addition, there is a vegetarian menu, and you can pick any course off of the vegetarian menu as well, mixing at matching as you please. The restaurant is actually insanely accommodating - if you let them know in advance, they can also do a vegan tasting. Or, gluten free, which doesn't just mean they skip the bread, or bring you stale outsourced bread, instead they provide multiple house baked breads and other treats! The table next to us had a gluten free diner, and I've never seen someone with a special diet so well taken care of. Every step of the way, she was given something extra special, even at the end, when we received a take home pastry for the next day. Speaking of the pastry, the course numbers are a serious understatement. For example, with the 5 course menu, you first receive 5 canapes, a substantial amuse bouche, bread service with amazing breads that you do not want to skip, then 3 of your courses, then a palate cleanser, your final 2 courses, then a slew of mignardises, which includes the standard chocolates, candies, and pate de fruit, but even includes puddings, and then, when you think it must possibly be over, you get donuts with the bill. 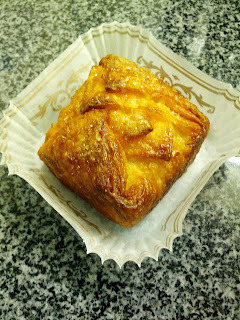 And of course the aforementioned take home pastry. If you were celebrating a birthday or other important event, they also throw in another dessert course that includes fresh chocolate chip cookies and shakes. And to start, they offer caviar and champagne service. This is a serious meal, and doing it in the middle of the day actually seems far more fitting than at night ... I can't imagine having this meal in the evening and possibly being able to digest and go to sleep! I also cannot fathom having the caviar, 8 course, and birthday celebration ... I'm curious how many people can pull that off, while still having all the bread and mignardises. There are optional wine pairings, also $108 for the 5 course, or $135 for the 8 course. I wanted just a little wine for the meal, to help highlight my dishes but not really get me drunk, so I had the sommelier pick some wines that were available by the glass to go with mine. He selected a riesling to go with the majority of my courses, and then a half glass of tokaji to go with my foie gras, and a half glass sweet dessert wine to go with my dessert. This was the right amount of wine, but the pairings didn't work very well (details below in the food notes). In the future I'd try to do something different, perhaps splitting the regular pairing. The restaurant decor is formal and fancy, the patrons dressed up even at lunch time. The service was all very good, definitely formal, but not quite stuffy. We were served in unison. Dishes were cleared at the appropriate time, new silverware replaced appropriately, etc. Thorough explanations were given of every dish. The meal was nicely paced. The only service issue we had was that we were not offered any coffee, espresso, or other drinks to go with our desserts, and I really, really wanted coffee to pair with the sweet dessert. The bread service was also slightly strangely timed, where we were left with no bread but really wanted some to pair with our food. 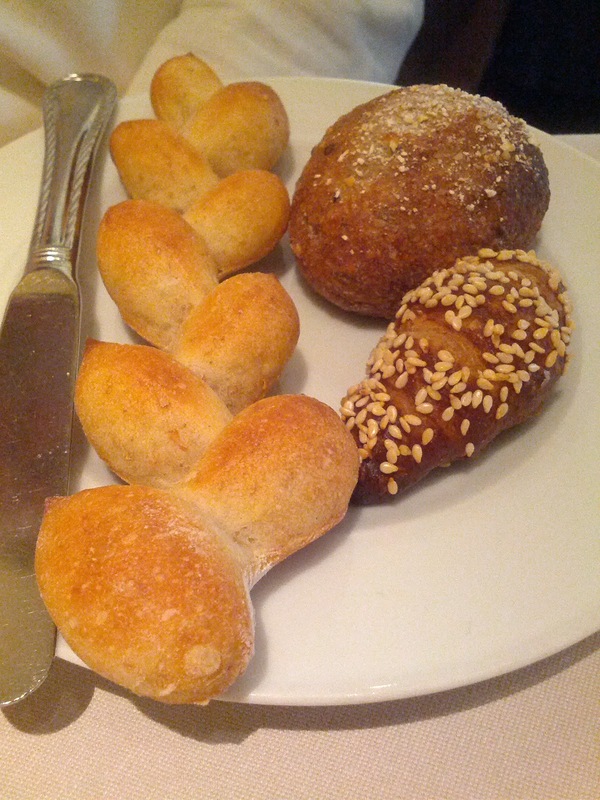 I think this is because we were in the last seating, so they were not circulating with the bread basket as regularly. At the end of the meal we were offered a kitchen tour. Since we were one of the last tables, the kitchen was fairly quiet and the chef had stepped out to walk his dog in the lull between lunch and dinner service. It was nice to get a behind the scenes glimpse, but it would have been much more fun to see the kitchen in action! What we did see was how immaculate the kitchen was, with well designed areas for each function. Overall, the meal was good, but there were no dishes that really, really wowed me (actually, wait, that isn't true - the donuts are totally worth driving 1.5 hours for. I'm not joking. But of the "real" courses ...). There was also nothing that was bad either. These were all well thought out dishes made with high quality ingredients and executed perfectly, but something just felt safe and slightly boring to me. I realize how absurd that statement is, given that the meal involved spheres, gelees, mousses, foams, and shattered ice cream. I've been doing a ton of high end dining lately, eating lots of Michelin stars and molecular gastronomy, so I guess I am rather hard to impress these days. Anyway, I'd go back if in the area, as this was one of the better meals I've had this year. The staff is clearly very skilled and the price value here is high, particularly with all the extra treats thrown in! And did I mention the donuts? Cyrus always presents you with a tower of canapés to start, before you even order. 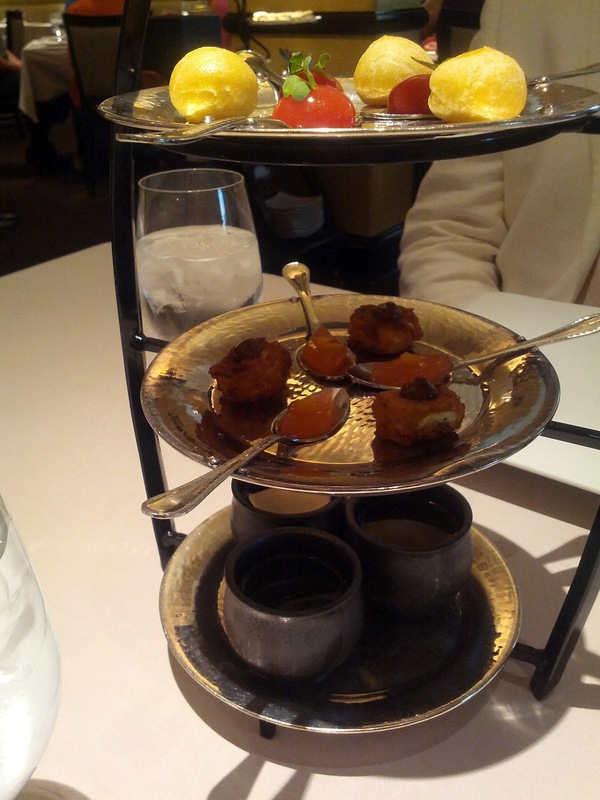 The tower has five items, one for each of the 5 tastes (sweet, salty, bitter, sour, and umami). We started at the bottom, so as to conclude with the sweet top! Umami: shitake mushroom, yuzu, and lemongrass broth. This was a warm, pure broth. The yuzu really came through on the finish. It was a little boring to just sip on broth though. The flavors were good and I think it would be really delicious as a full on soup with some mushrooms, other vegetables, or perhaps some dumplings. Sour: okanomiyaki topped with tamarind sauce. This was a tasty little bite! The okanomikayki was slightly fried, warm, and somewhat creamy on the inside. The tamarind sauce on top left a sour finish, exactly as designed. I wish this were bigger! Bitter: campari and grapefruit gelee topped with candied grapefruit peel. The grapefruit peel on top really gave it a great bitter finish, again, exactly as intended. Salty: gruyere gougere. This was awesome. A warm gougere filled with amazing melted gruyere fondue. The cheese was incredibly flavorful and delicious. Even though it was described as a fondue, I don't think any of us were prepared for it to be so perfectly creamy and melty. I bit it in half to look inside, and wound up with melty cheese all over the place :) Delicious. I'd eat more of these in a heartbeat! Sweet: strawberry bubble topped with micro wasabi. Some molecular gastronomy going on here. This burst in a really fun way when you bit into it, exploding what tasted like the most amazing pure strawberry jam ever into your mouth. It would have been disastrous if someone had tried to bite into this just to see what it was without putting the whole thing in their mouth! I thought this was fun and playful, but one of the other diners commented on how sick he was of spheres. Granted, we've seen a lot of them lately. We all thought the gougere was the best of the set, and that the okanomiyaki was the 3rd best, but we differed on the rest. Our ordering of these really did reflect exactly our tastes! My picks were: gougere, strawberry bubble, okanomiyaki, canpari, and finally the broth. The other diners, having much less of a sweet tooth, both put the strawberry last. One other diner picked: gougere, canpari, okanomiyaki, broth, strawberry and the other picked: gougere, broth, okanomiyaki, canpari, strawberry. These were a fun set of tastes to get us going and excited about the meal. I really love the idea of stimulating all the senses! 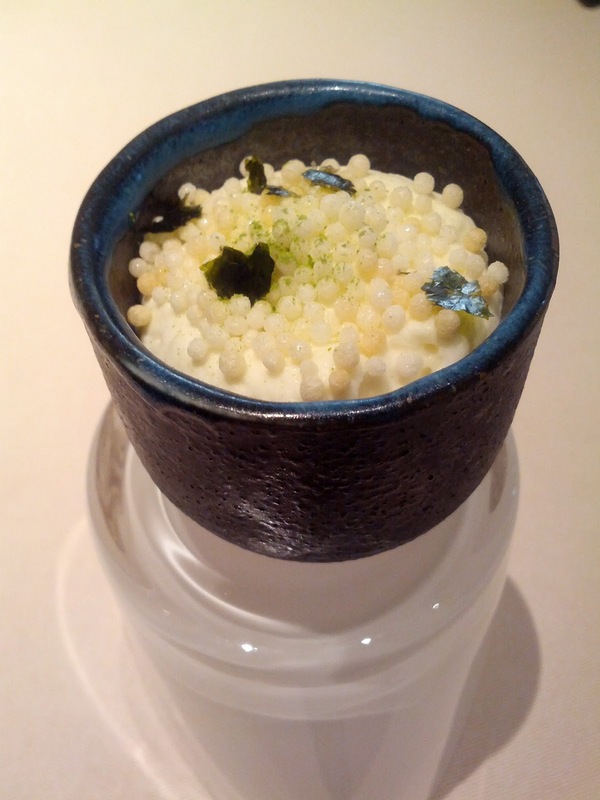 Amuse bouche: Uni puree, cauliflower cream, puffed rice, nori, matcha powder. Next up was the amuse bouche. A little stand was placed in front of each of us, and then a small cup perched upon it. This was a parfait of sorts, made up of uni puree, cauliflower cream, puffed rice, a few tiny shreds of nori, and matcha powder. There wasn't nearly enough uni for me. I adore uni, and I barely got a taste of it in here. It came as a very thin layer of very smooth puree in the bottom of the cup. The majority of the cup was filled with an incredibly fluffy, mousse-like, cauliflower cream. One other diner described this as being as light as whipped cream. It tasted incredibly like cauliflower. I'm rather sick of cauliflower, and I really, really wanted to taste the uni, so this was unfortunate to me. The cauliflower and uni flavors did go together well. The puffed rice on top gave a great crunch and added texture to the whole thing. I'm a sucker for creamy and crunchy contrasts! However, the nori and matcha were completely lost in the strong cauliflower flavor. I really wanted to love this, as I really enjoy savory custards and uni, but really this was just too much cauliflower cream for me. When we discussed it afterwards, we all had really differing opinions on how much uni was in here, and on how strong the cauliflower flavor was, so it seems like these may have been inconsistently constructed. While I expect some variation, and our perceptions to be different, one person really seemed to have gotten a lot more uni than the rest of us. Great concept though. Goat's milk butter, cow's milk butter from Spring Hill, Mendocino sea salt, pink Hawaiian salt. In preparation for the bread service, we were given a duo of butters and salts. The goat's milk butter indeed had a goaty taste to it, and thus I didn't care for it (sigh, I wish I could like goat milk!). The cow's milk butter was good, standard, high quality butter. The salts were both very flavorful. At this point, we'd already had 5 canapes, an amuse bouche, and still had our five courses left! So when we saw the bread basket coming, I was initially tempted to skip the breads, but they had so many options, and they all looked sooo good. And, they were warm. And made in house that morning. How do you say no? I'm glad we didn't, these were far better breads than most restaurants serve. We did show some restraint, and each only picked three (out of 7? choices). 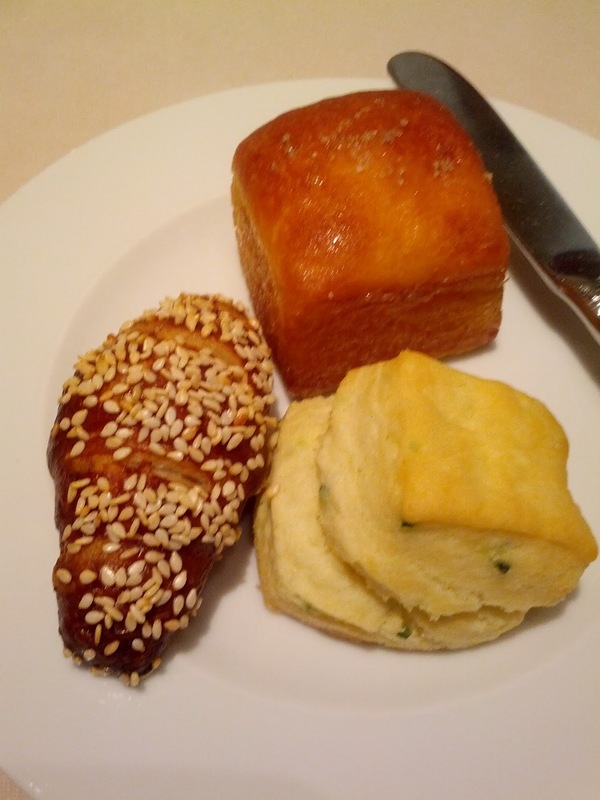 Pretzel croissant, brioche, chive biscuit. My picks! All served warm. The pretzel croissant was very buttery, flaky, had a nice crisp crust, and was loaded up with sesame seeds, which provided a nice heartiness. I'm not really sure what was "pretzel" like about it however besides the seeds. This was certainly a well executed croissant, but it made me really, really crave the pretzel croissant from City Bakery in New York. This was great to eat on its own in-between courses. The chive biscuit was incredibly moist, full of chive flavor, and also fairly buttery. Really tasty, although it seemed somewhat out of place. It didn't really seem right to be eating this heavy biscuit with my light salmon starter, and there wasn't really anything on the menu it seemed like it would really pair with. It was really good though. Fantastic breads, and I loved the variety of choices, no standard dinner rolls here! Epi, honey wheat, pretzel croissant. Since I wanted to try the butters, which didn't really go with my selection, I also tasted my neighbor's picks. His were more standard dinner breads. The epi was adorable. I've never seen one so small before. It had a nice crust with a good chew on it. I believe it was sourdough. Decent, but I'm spoiled by getting Acme Bakery's amazing epi all the time. The honey wheat roll was really hearty, full of seeds, and lightly sweetened. Like the epi, it had a good crust on it. If I'd wanted a more classic roll, I'd certainly get this. Not pictured was the roasted garlic sourdough that none of us selected. Finally! Our first real course arrived. We all selected the same dish (our other choice was a "Bacon, Lettuce and Tomato" dish that didn't sound nearly as appealing). The dishes all arrived simultaneously, and the broth was poured in tableside. This was local king salmon, first poached in olive oil, and then chilled. 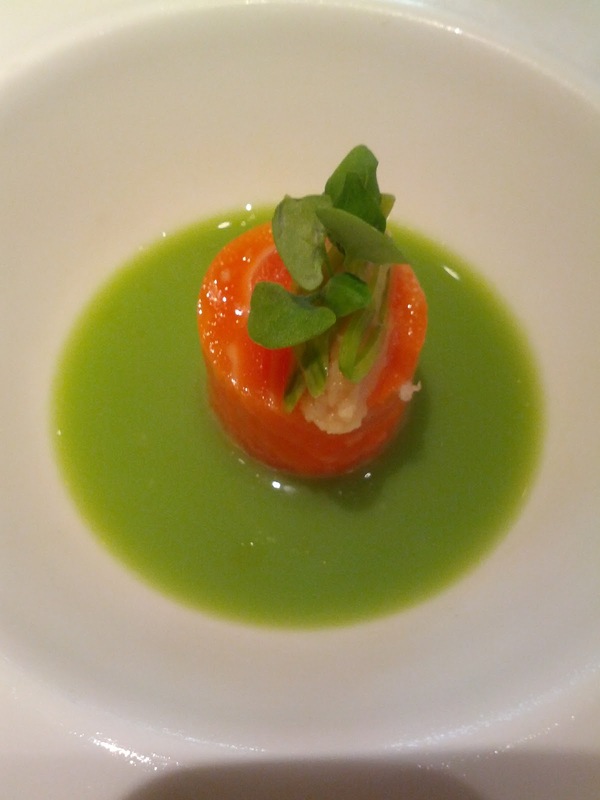 It was topped with finely grated ginger and micro basil. Underneath was the shredded daikon. The salmon was a good firm texture and consistency, but wasn't very flavorful. It seemed like the olive oil poaching may have wiped out the flavor. It wasn't bad, but was very forgettable. The ginger was very intense. I was the last to try my dish as I was taking photos and notes, and thus had a warning that the ginger would be strong, but my fellow diners were a little shocked when they took a bite and wound up with a mouth full of ginger. A little went a long way, and there was perhaps too much on the plate, or at least, it was really easy to get too much in a single bite given the plating. I mixed some into the broth and thought it complimented it really nicely and really appreciated the ginger element. The diakon shreds in the bottom added some good texture. The broth was delicious. Really flavorful and just let the phenomenal flavor of fresh spring peas shine. I eagerly lapped up all of the remaining broth with my bread. Overall, this dish really didn't impress me, but I really liked the broth. I'd gladly have consumed a bowl of it. Who needs the salmon anyway? This was my least favorite dish. I had this paired with a glass of riesling. It wasn't particularly noteworthy. Since I didn't want more than two glasses of wine total for the meal, the sommelier suggested that I get this wine to pair with my first, third, and fourth courses since they were all seafood. I didn't find that this wine really went that well with any of the courses, perhaps I just didn't care for it much to begin with. 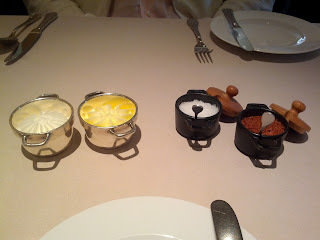 And of course, the dish we were there for, the foie gras! I was very excited for this, as clearly I've been on a serious foie gras kick and I love savory custards! This was beautiful. It is hard to see in this photo, but the foie gras mousse was topped with a translucent layer of cherry blossom gelee. This made the puffed barley, sea beans, shiso, and powdered cherry blossom on top look like they were floating above the surface. Stunning. There was a generous amount of foie gras mousse. It was perfectly smooth and creamy, full of foie flavor, and quite excellent. The cherry blossom gelee layer had a very subtle floral flavor. It had a slight sweetness to compliment the foie gras. The consistency was very jelly like and a little hard to break through. Like the puffed rice in the amuse bouche, the puffed barley here was crispy and added a fantastic crunch. I am really so into these creamy custards with crunchy bits on top! They remind me of two of my favorite things: ice cream topped with nuts/cocoa nibs/etc or greek yogurt topped with granola. I had this paired with a fantastic half glass of Tokaji Aszú, Királyudvar “6 Puttonyos”, Hungary 2003. Liquid sugar :) I can't get enough of tokaji these days, particularly paired with foie. 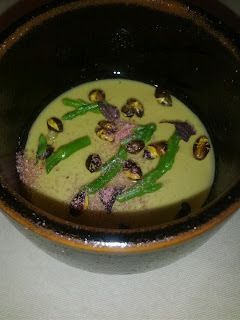 I was enjoying this dish, for the foie, for the creaminess, for the tokaji, but something seemed to still be missing. That is when I remembered that I had asked for the brioche roll in anticipation of this dish. So instead of just eating a spoonful of the parfait, I took a piece of the brioche, plopped the mousse on top, added a little gelee, and tried it that way. In an instant, it all came together so much better! The brioche, which was otherwise too buttery for me, was completely transformed with the creamy foie mousse spread on top. I know it sounds crazy that adding foie gras to something would make it less rich ... but it really worked. Of course, eating it in this way was a very different experience, and I oscillated back and forth between just having spoonfuls of the parfait, or spreading it on the brioche. I liked the completeness of the flavor when added to the brioche, but I enjoyed the actual experience of eating the creamy parfait on its own more. Overall, I loved the idea behind this dish, and really enjoyed eating the foie this way, but I did feel like there was something still missing to really take this up a notch, perhaps a stronger flavor in the gelee, or a fruit component? I'd still get it again, but it seemed like it could use a little more refinement. Or perhaps, I've just had sooo much foie gras in the past few months that it is really, really hard to create a version that wows me anymore. Don't get me wrong, it was good, and I'd get it again if I could. My favorite savory dish of the meal. At this point in the meal, everyone was supposed to receive a sea bass dish. But I was difficult and did not want any of the selections for the subsequent meat dish, and instead selected the scallop (normally the option opposite the foie gras). The chef decided that a better progression for me was to have the scallop at this point, and the bass while they were having their meatier main courses. 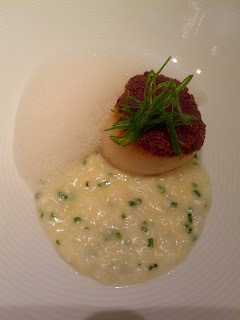 The scallop was crusted with chorizo, served atop a sweet corn puree, with a lobster froth on the side. When I first cut into the scallop, I was very disappointed. To me, the perfect scallop is one with an excellent sear on the outside, a slightly caramelized crust, and medium-rare on the inside. This had no real sear on it and was fully cooked all the way through. However, the scallop was large, fresh, and once I got over my disappointment of the doneness level, the dish really grew on me. The chorizo crust was a really fantastic compliment to the scallop. Salty, flavorful, but not at all overwhelming. It was similar flavor-wise to a more common bacon wrapped scallop, but was far more refined and a lot easier to physically eat! 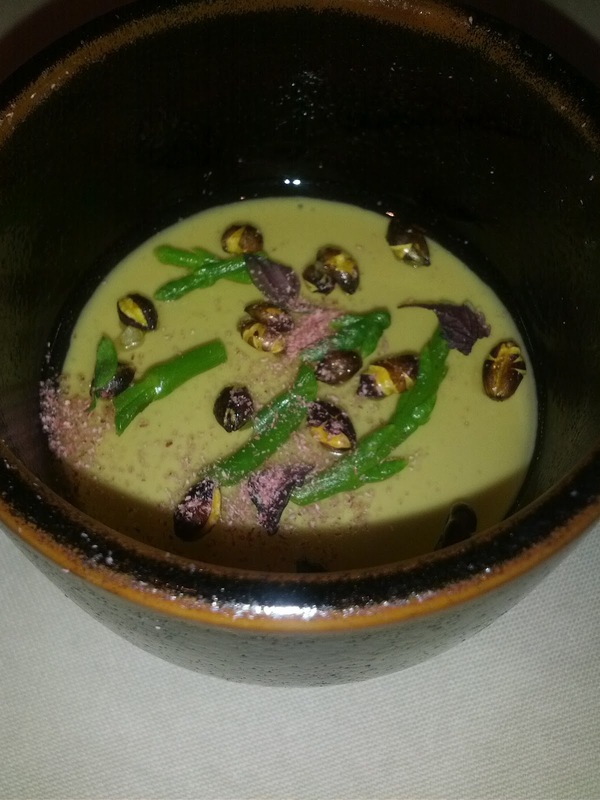 The corn puree was absolutely delicious. It was sweet, creamy but with texture, and just really quite good. The lobster froth was very light and foamy, with a subtle flavor. I'm not sure I could have identified it as lobster if I hadn't been told. I was impressed by how well these components all worked together, highlighting different aspects of the scallop. The chorizo brought out a meaty aspect, the corn puree brought out the sweetness, and the foam accented the delicateness. Really a wonderfully composed dish. If the scallop had been cooked a tiny bit less, this would have been a home run. My second favorite savory dish of the meal. Palette cleanser: avocado lime lollipop. To prepare for the main course, we were brought a palette cleanser. 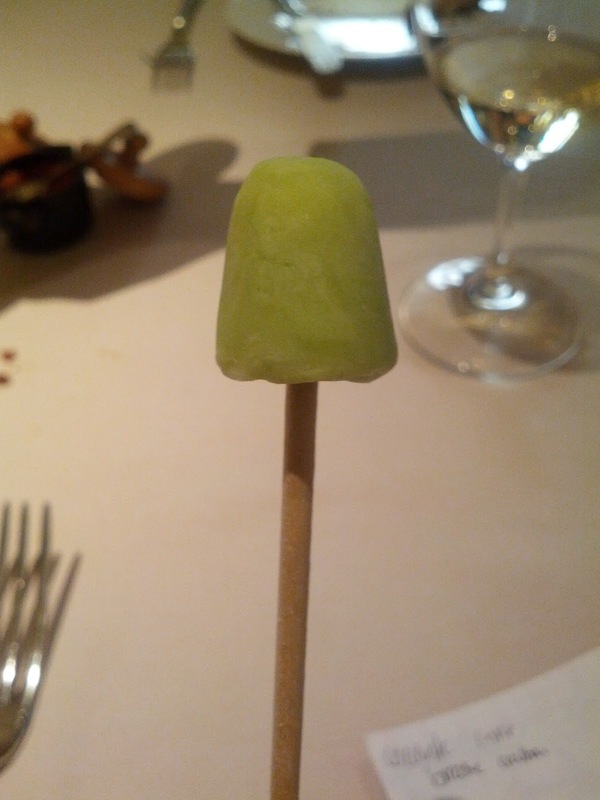 These were frozen avocado lime sorbet lollipops. They were cold, creamy from the avocado, with a nice lime flavor. They were presented slightly awkwardly - we were each supposed to take one, eat it, and then give the stick back immediately, so the server stood there expectantly watching us and waiting for the stick back. I couldn't really take the time to take a photo, write down what it was, and savor and appreciate it. But I'm likely the annoying exception (that said, I think every table around us had someone with a full size camera taking photos of their food, where I was just taking quick snaps with my phone!). I liked the idea here, particularly the cold aspect to it, and the sorbet lollipop was cute, but the actual execution didn't seem like much of a palette cleanser, as it was pretty rich from the avocado and not very refreshing. This was the main dish my dining companions selected. I haven't ever really cared for beef cheeks, mostly due to their texture, which is often kinda gummy or slimy. However, this beef was incredibly tender, with a fantastic crust on it. The flavor was very pronounced, very ... beefy. 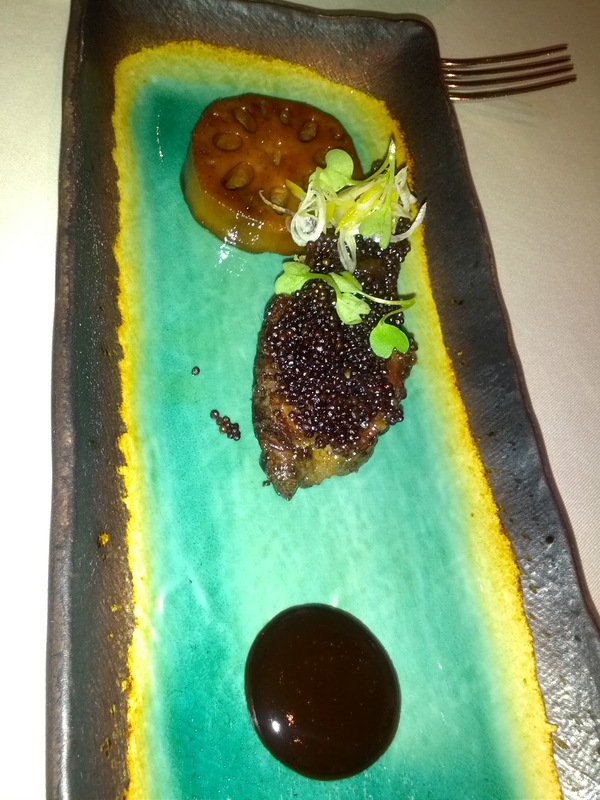 The black garlic puree was flavorful and very good. I love the subtle flavor of black garlic. The lotus root was miso glazed and my favorite component of the dish. Cooked just enough to be soft, yet still fairly crisp, although it was a little bit strangely sticky. My dining companions both did not care for it, I think due to its sweetness, so I got to enjoy both of their pieces. This dish would have been really complemented by a nice glass of red wine. I'm glad I didn't pick this dish as it just really isn't my thing, but it was well executed for what it was. My main dish was the bass that the others enjoyed while I had the scallop. This was the same dish that they had, except scaled up to a main dish portion by doubling the fish. The bass was cooked nicely, moist and tender, but it didn't have much flavor. The skin was not crispy nor slimy, but just kinda there. I would have preferred it without the skin, but it did make it look a lot prettier. The asparagus was served two ways: a shaving of white asparagus and a full spear of green asparagus. The spear was cooked perfectly, slightly al dente, crisp. It was wrapped with umi-budō, which I didn't really taste, but again, looked nice. The pea sprouts were likewise perfectly executed. Slightly crispy, very fresh. The sauce was a lemon verbena beurre blanc. I normally love sauces, but this one I really did not care for. It was salty and had a weird thick mouth feel. There was nothing wrong with this dish execution-wise, in fact, quite the contrary, I can't really fault the technique on anything, but it was just rather boring. No component really compelled me to eat more of it, nor did they combine together in any meaningful way. Perhaps if I liked the sauce it would have tied things together better? Or perhaps scaling it to a main dish portion this just didn't work as well. 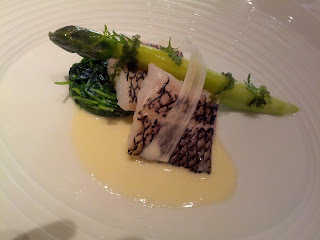 For example, when the others had this dish, they had the same amount of asparagus and pea sprouts, but half as much fish, which seems more balanced. Either way, this dish bored me and really seemed to be missing something. Next up were our main desserts. They arrived really rapidly after we finished our last savory courses. I was surprised by this, because it was faster pacing than the rest of the meal, but mostly because we were not offered coffee or any other drinks with our desserts. I really enjoy having some bitter coffee with my sweet dessert, and was a little upset that we didn't have any. I would have asked for some, but our desserts involved frozen components, so they would have melted while waiting for the coffee. Anyway. My dessert was this crazy looking dish. It needs some explanation! 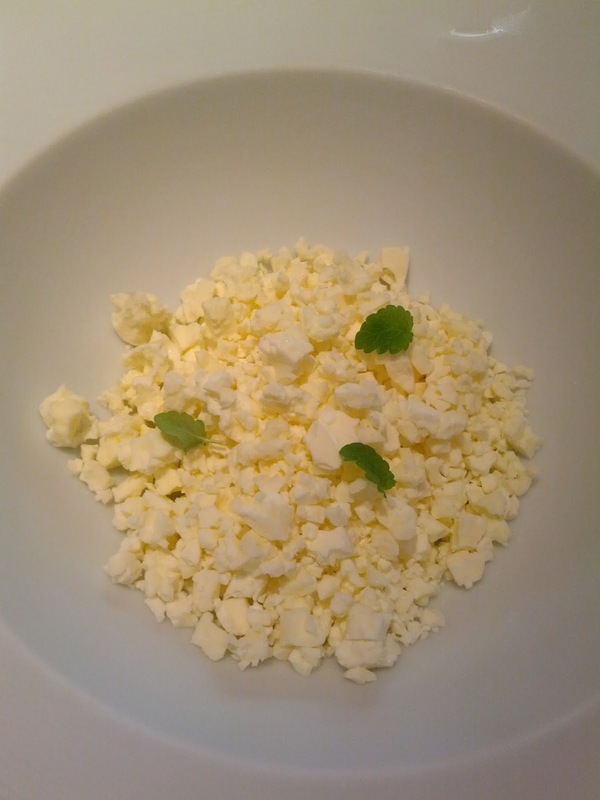 On top was the "cream cheese ice cream", with a few little shiso leafs. As you can likely see, this was no ordinary ice cream. It was shattered into pieces. It was cold, but due to this form factor, not creamy. It unfortunately didn't have a very strong cream cheese flavor. While I thought this was fun and creative, it really just wasn't nearly as tasty as regular ice cream. Also scattered inside of the ice cream pieces were a few tiny little bergamot meringues (the hard style). They were cute little things, and again, it was fun to eat and discover them amongst the rubble of ice cream, but they weren't particularly good. There was also some sort of streusel, I'm not quite sure what it was, underneath all of the ice cream. After a number of spoonfuls of this, I was a little stumped. Where was the yuzu crémeux? Was I just missing something? I know this was a creative dish, and the ice cream certainly didn't come in an identifiable form, so perhaps I just missed the crémeux? But I sure didn't taste any yuzu. I flagged down a server to ask about this, and he said there should have been a pudding in the center. There definitely wasn't in mine! My dish was whisked away and quickly replaced by a new one, with a center of a very sour yuzu pudding. There is no way I could have missed that the first time! I didn't really care for it, too sour for my liking, and the flavor seemed to clash with the ice cream. This was a fun and creative dish. The play of different textures and temperatures was particularly interesting. It was enjoyable to eat, but it just didn't taste very good. This made me sad, since it sounded like all things I like - pudding, meringues, ice cream! My least favorite dessert. This was paired with a really sweet wine, I forget what it was. I thought the pairing was rather horrible, as they were both just way too sweet. I really, really wanted coffee! We knew when we saw quotes on the menu that this wouldn't be a normal affogato. In fact, it did not contain any coffee whatsoever, nor traditional ice cream. On the bottom was a chocolate brioche crouton. 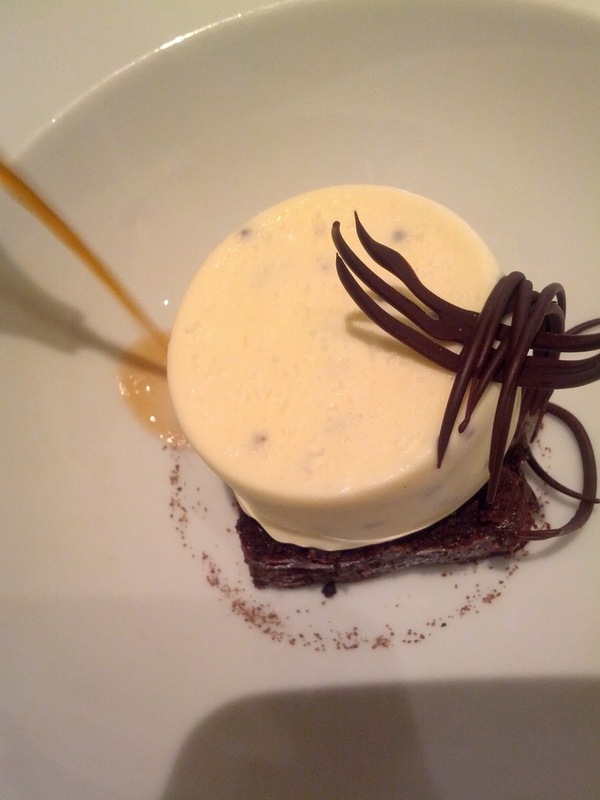 It was topped with the condensed milk semifreddo, and a garnish of chocolate. Then, a warm rum sauce was poured over it tableside. The chocolate brioche was served warm, always a win in my book, particularly when paired with a frozen component. It had cocoa nibs throughout, which gave a great crunch. It quickly soaked up the sauce, making it moist and quite delicious. The condensed milk semifreddo was creamy and sweet, lighter than a standard ice cream. I really liked it, and thought it went well with both the brioche and the sauce. The sauce was warm rum sauce, very boozy. This dessert was good - basically moist chocolate cake, warm sauce, cold creamy ice cream ... kind hard to go wrong :) However, it really, really needed some coffee to go with it! It was good this way, but would have been soooo much better with the contrast of the bitter coffee. I really wish they had offered us some coffee. I also wish I'd picked this dessert! It was my favorite of the main desserts, and second favorite of all of the desserts. Our dining companion who does not like sweets selected this dessert. The panna cotta was a good texture and consistency, but was, unfortunately for me, very goaty, as advertised. It was topped with the parsley-lime ice, which was a great contrast both in temperature and texture to the panna cotta. Totally not my thing due to the goat milk, and I don't think my friend loved this, but for a dessert, this was about as good as it gets for him, being slightly sour and refreshing, rather than just sweet. If I liked goat milk, I would have really enjoyed this. Mignardises: english toffee, ginger chew, peanut butter cup, salted caramel chocolate, champagne pate de fruit, hazelnut crusted chocolate truffle, huckleberry macaron. At this point, we asked for coffee. While I really had wanted it with the main desserts, I also thought my chocolates would be enhanced by it. First, the chocolates and candies. English toffee: This was interesting, but not very good. The bottom was a saltine, then came the toffee, a thin layer of milk chocolate, and finally almond slivers. The toffee was just sweet and not very complex, the saltine kinda stale tasting, the chocolate layer too thin to taste, and the nuts were also kinda lost. Note that I'm spoiled by regularly consuming the insanely addicting almond brittle from GL Alfieri at the Ferry Building, so my toffee standards are rather high. Ginger chew: This had a really strange mouthfeel. It was kinda mushy. Filled with shreds of ginger. Not really what I was expecting. I didn't like this. Peanut butter cup: Not your standard peanut butter cup! The majority of it was a peanut infused milk chocolate, and then it had a dark chocolate top layer, and was topped with some salt and nuts. The body of it was crunchy from little bits of peanuts. The salt was the perfect contrast. This was really quite tasty, my second favorite of the candies. Salted caramel filled chocolate: This had a milk (possibly dark?) chocolate shell, with a gooey salted caramel filling. It definitely lived up to the salted part, so many “salted caramel” things fail to really deliver on the salt. This was pretty good. Champagne pate de fruit: Pretty standard pate de fruit. It was sweet, with a good mouthfeel, but the flavor was not that interesting. Hazelnut crusted chocolate truffle: This was by far my favorite. It had a milk chocolate shell, a creamy sweet milk chocolate filling, and was rolled in candied crunchy hazelnuts. Great flavors and nice contrasting textures from the creamy filling and crunchy coating. Certainly one of the best chocolates I've ever had at a restaurant, and on par with many fancy truffles I've had. Huckleberry macaron: This was very, very sweet. The cookies were not quite right, they did not have the crisp exterior that makes for an awesome macaroon. The filling was a little odd as well, with two components: one was insanely sweet, I'm not sure what it was, and then there was a tiny bit of huckleberry jam filling too. The huckleberry jam was very good, but overall this was just too sweet and not perfectly executed. 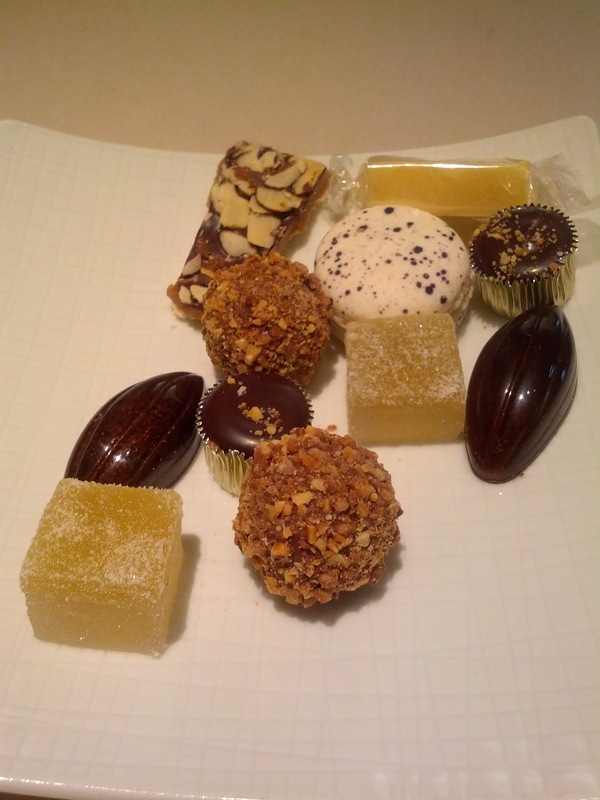 The mignardises cart contained much more than just candies. It also offered puddings! Not only do I get a slew of desserts after my dessert, I get puddings? Be still my heart! The milk chocolate pot de creme was topped with a malt pudding layer, a oreo cookie like chocolate crumble, and little chocolate balls. 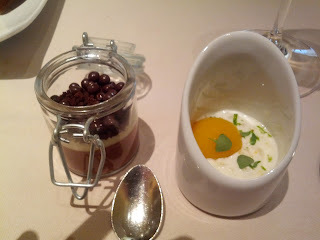 The puddings were creamy and a great consistency, the crumble and little balls gave a contrasting crunch, and there was plenty of chocolate flavor. Served in a cute little jar. This was all pretty good, but I'm spoiled by having some incredible chocolate puddings at work, and the pudding didn't have quite the intense chocolate flavor that some of those have had. Good, but not great. The rice pudding came with a mango sphere. More spheres! The presentation, I think intentionally, reminded me of an egg. The pudding was creamy, the rice cooked well, and there was a good balance of rice to pudding. The mango added a good additional, sweet, flavor. Again good, but not great. One side of the lollipop was root beer flavored, the other side vanilla cream flavored. This was a really fantastic lollipop! The root beer flavor was really strong, and the vanilla mixed in really was exactly like a float. 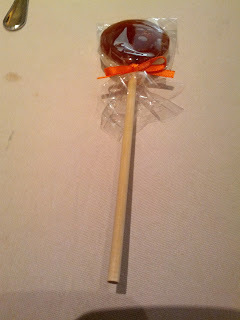 Dessert in a lollipop! When our check arrived, it came with even more desserts. Yes, seriously. After a full size dessert each, a plethora of puddings, candies, and chocolates, they thought we still needed more. A little donut for each of us! They were clearly fresh. Piping hot. Covered in an delicious maple bourbon glaze. These things were downright amazing. 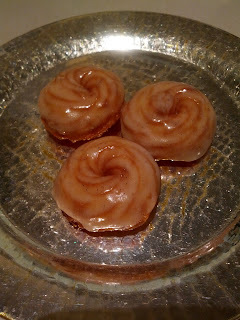 Ridiculously sweet from all of the glaze, but absolutely addicting. Remember how one diner doesn't like sweets? Lets just say that his extra donut didn't stand a chance of being wasted, no matter how full, or sick of sweet we were at that point. These were perhaps the best donuts I've ever had in my life. Being fresh out of the fryer certainly elevates them considerably, but they were also just really well done. Moist, fluffy, and the glaze. Oh the glaze. So tasty. Our server came back over to ask if we needed anything else. I jokingly exclaimed "yes, more donuts!". Ok, maybe I was half serious. I think I was joking. I was stuffed! So much sweets! She didn't miss a beat. "Sure, another round of donuts?" And a few minutes later, three more appeared before us. And guess what, that extra donut disappeared even faster this time. Seriously, so good. I can't get over these things. We took some time to walk around the town after our meal, and when we were walking past the restaurant on our way back to the car, I said that we should just go get seated at the bar to have drink and more donuts. This time I definitely wasn't joking, but no one else followed my lead. These were, hands down, my favorite dessert of the meal, but also, my favorite dish. 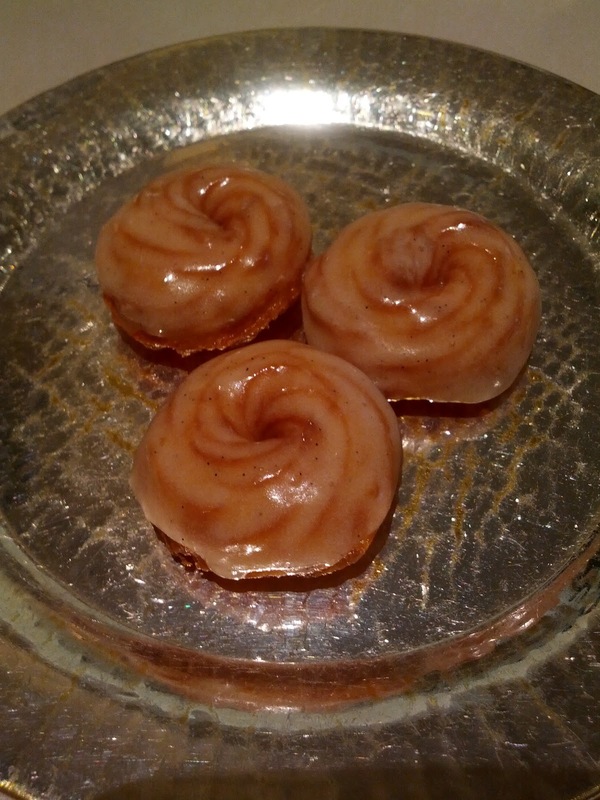 I feel ridiculous going to a two Michelin star restaurant and raving so much about the donuts of all things, but these were absolutely amazing. The coffee came with a pitcher of steamed milk. I normally drink my coffee black, but I love it when they include steamed milk. My ideal coffee drink is actually black, with just a dollop of foam on top (no milk mixed in), and this allows me to create that! 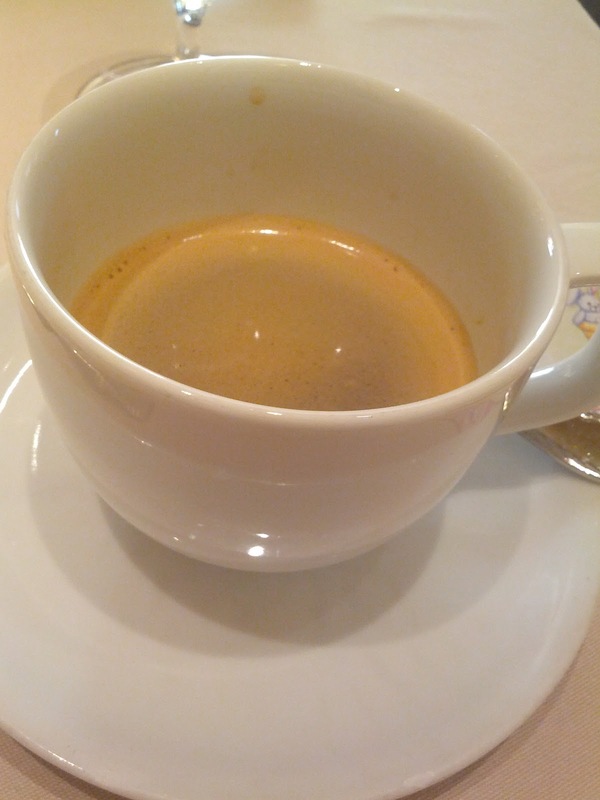 The coffee was ok, nothing particularly memorable, which for a decaf is good. But wait, there is more! Everyone receives a take home pastry as well! Boxed up, and packaged with a label that reads, "Tomorrow?" Cute! Also included with the pastry is a copy of your personalized menu. Since one of our diners doesn't like sweets, I got two of these. I got to try one later that evening and one the next day. While it held up ok, it was certainly a lot better the first day, as the exterior lost some of its crispness overnight. Still, it was awesome to wake up to for breakfast! Today I attended one of the Artisan's Markets at Williams-Sonoma. They hold these once a month, and bring in assorted merchants each time. One of the vendors today was Snake & Butterfly, a local chocolate maker. I've encountered them at a few other events, but I've never really been that into their chocolate. The bars are all made with 62% dark chocolate. Notes on the bars I've tried. As always, multiple tastings are reflected in brackets. 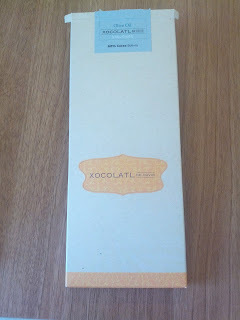 Today my local amazing chocolate shop (Fog City News) had a guest chocolatier on site: David Briggs, from Xoxolatl de David. I'd tried several of his bars before at the now-defunct weekly tasting events they used to hold, and had been very impressed. I was really excited to go today to get a chance to try even more of his products! Unfortunately, he only had two that I hadn't tried before to sample, even though he makes many more varieties. His chocolate bars all use one of three different chocolates as the base: 68% Chocolate from Bolivia, 72% Chocolate from Ecuador, or 74% Chocolate from Dominican Republic. Almost all include fleur de sel for a really nice salty finish. The bars are very unique, featuring savory ingredients like cheeses, olive oil, pork products, etc (he was one of the first making a bacon bar). My dining companion who does not like sweets came along today, which is very rare for a chocolate event, but I promised him savory chocolate, and he was indeed impressed enough with this to purchase several bars. I've never seen him buy anything besides a 99% or 100% before! Some of the other really interesting sounding savory varieties, that I haven't tried, include Chicharrón, Hazelnut & Black Truffle, "Salt & Pepper", Creme Fraiche, River's Edge Chevre, Rhubarb ... the list goes on and on! I've only had the chocolate bars, but David also makes caramels, nougats, chocolate covered nuts, and a variety of other confections. And, as I just discovered ... foietella: foie gras chocolate spread. Yes, really. How do you think this sounds to a foie gras lover like me? Amazing ... imagine it spread on a croissant? Or warm brioche? I must order this before July 1! Anyway, I highly recommend these bars. Unique, complex, and really quite tasty! In particular, I love how the tasting experience changes as you savor these, the finish on many of them is just incredible. 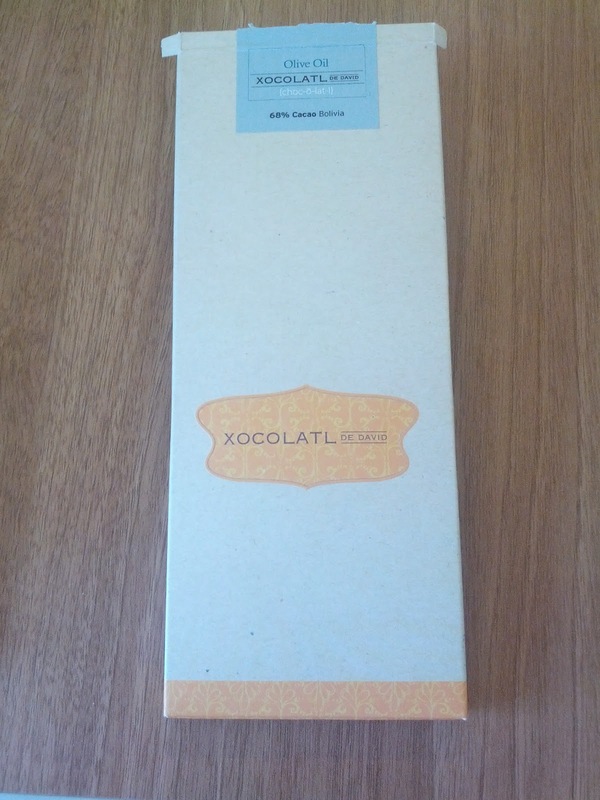 My tasting notes, from past chocolate tastings, purchases, and today's event. As always, subsequent tastings are in brackets. Almond & Pimentón: 68% dark chocolate from Boliva. “Marcona almonds fried in extra virgin olive oil, and seasoned with smoked spanish paprika, and fleur de sel”. Tasting notes: This bar is amazing. Smooth, glossy dark chocolate with a subtle bitterness, with whole flavorful almonds, a nice spice from the paprika, and an amazing salty finish. The tasting experience is incredibly complex, starting with the bitterness and almond flavor, moving into some spice, and finishing with a great smoky, salty flavor. [ This bar is really good to have a small bite of, but it gets old fast. After having it a number of days in a row, I’m pretty sick of it. ] [ After not having it for a while, it grew on me again. Nice smokey flavor. ] [ Re-visited a few months later. I love the smokiness to this bar! And the almonds! ] He also makes a chocolate covered nut snack version of these: chocolate covered Marcona almonds fried in extra virgin olive oil, and seasoned with smoked spanish paprika, and fleur de sel. I'd LOVE to try those!!! Miso: This one isn't released yet, but we got a taste. I'm not sure of the details of it - he mentioned a white miso from a local producer, and it included a number of other ingredients as well. Tasting notes: This was incredible. Salt and chocolate are a classic combination, and in this bar, the salt was replaced by the miso. It worked really incredibly well. There was so much flavor going on in this bar. I just got a tiny taste, so I didn't get to really experience it fully, but I'll certainly buy this one when it comes out! Piment d'Espelette: 74% organic chocolate from the Dominican Republic, piment d'espelette, fleur de sel. Tasting notes: Hard and glossy dark chocolate, decent chocolate flavor, not much spicing. I appreciated the hit of salt. Salted Caramel: 72% chocolate from Ecuador, filled with salted caramel. Tasting notes: caramel very thick, but beautiful flavor. Loved the salt in it. Chocolate unremarkable.